It’s that time of year again. The time when we make resolutions to lose weight, take charge of our finances, manage our time more effectively, etc., etc., and etc. We all make resolutions to improve something in our lives at the beginning of each year. In some cases, we maintain these resolutions throughout the year. But more often than not, they will fall “by the wayside” fairly quickly. Our intentions are good, but our ability to “stick to the knitting” often falls short. According to historians making a new year’s resolution is a tradition that may date back nearly 4,000 years to Babylonian times. It is reported the Babylonians believed that whatever a person did on the first day of the year would have an effect on their lives that lasted throughout the year. This tradition continued with the Romans when, in 153 B. C., Julius Ceasar set January 1st as the date for making new year’s resolutions to honor the Roman god Janus, a two faced god. It was believed Janus could look backwards to the past while simultaneously looking forward to the future. Janus is the god of beginnings, transitions, doorways, gates, and endings. The month of January, viewed as the beginning of one year and the ending of the prior year, is named after Janus. This was seen as a symbolic time to make resolutions for the upcoming year. 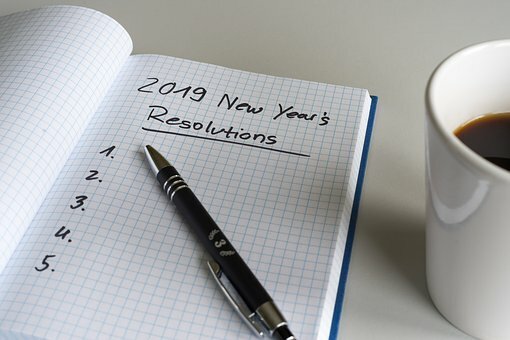 Why do we continue to make resolutions? Even though the success rate for New Year’s resolutions is reported to be less than 20%, nearly half of all Americans do make at least one New Year’s resolution. Reasons cited for making resolutions include the appeal of a fresh start; the idea of improving yourself; or just because it’s a tradition. Most resolutions are somewhat vague. We promise to quit smoking, to stop eating junk food, or to lose weight. Or we resolve to start an exercise program, volunteer in our community, save (or earn) more money, or just to enjoy life. The one common denominator in each of the goals listed above is they often do not include any way to measure their effectiveness. In order to achieve any goal it must be SMART – specific, measurable, achievable, realistic and timely. Those individuals who really think through what they want to achieve and set clearly defined parameters that allow them to measure their progress, enjoy a much higher success rate. Alternatively, there are those among us who just refuse to make New Year’s resolutions. The main reason cited for not making even one resolution is that we are doomed to fail. Certainly we can all understand their reasoning. Why set a goal when you cannot imagine yourself succeeding? So at the beginning of this New Year 2019 we can choose to do nothing. We don’t have to set any goals or make any resolutions. But for those among us who wish to restart the clock and set about reaching our full potential, we can and should consider making a New Year’s resolution. For me making resolutions in the New Year is the triumph of hope over experience. Best wishes for a happy, prosperous, and successful new year! “Always bear in mind that your own resolution to succeed is more important than any other.” - Abraham Lincoln. Please share your thoughts on New Year’s resolutions in the comment box below. Did you make any for this year? Why or why not? Marsha Witherspoon, CDFA is the Business Manager for Cole & Denny Architects in Alexandria, VA.
She currently serves as the 2018-2019 SDA National Treasurer. I love this post. I hope that we can all stick to our resolutions this year. Even if they are small. My New Year's Resolution: Show more appreciation! What a wonderful post. Thank you Marsha.